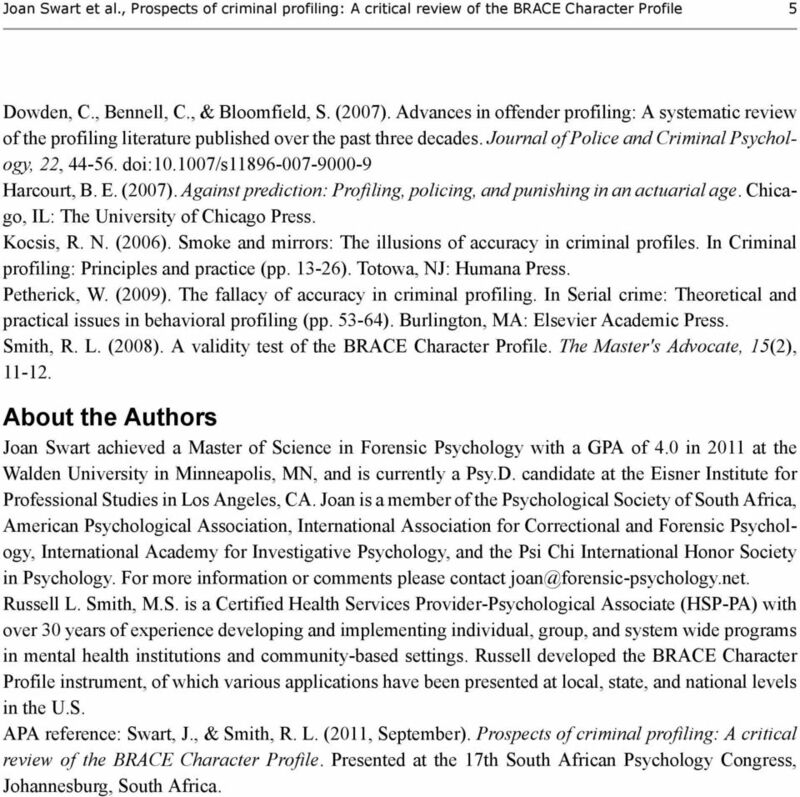 Download "Prospects of criminal profiling: A critical review of the BRACE Character Profile"
5 Joan Swart et al., Prospects of criminal profiling: A critical review of the BRACE Character Profile 5 Dowden, C., Bennell, C., & Bloomfield, S. (2007). Advances in offender profiling: A systematic review of the profiling literature published over the past three decades. Journal of Police and Criminal Psychology, 22, doi: /s Harcourt, B. E. (2007). Against prediction: Profiling, policing, and punishing in an actuarial age. Chicago, IL: The University of Chicago Press. Kocsis, R. N. (2006). Smoke and mirrors: The illusions of accuracy in criminal profiles. In Criminal profiling: Principles and practice (pp ). Totowa, NJ: Humana Press. Petherick, W. (2009). The fallacy of accuracy in criminal profiling. 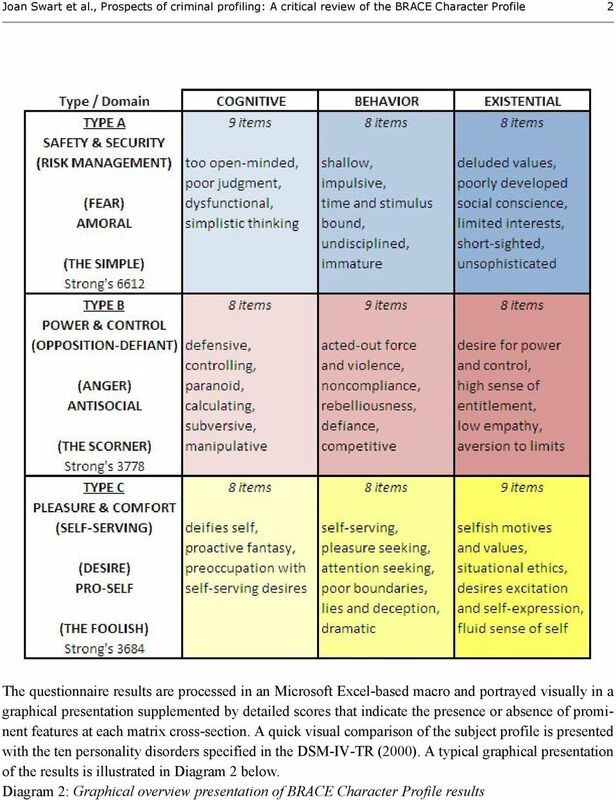 In Serial crime: Theoretical and practical issues in behavioral profiling (pp ). Burlington, MA: Elsevier Academic Press. Smith, R. L. (2008). 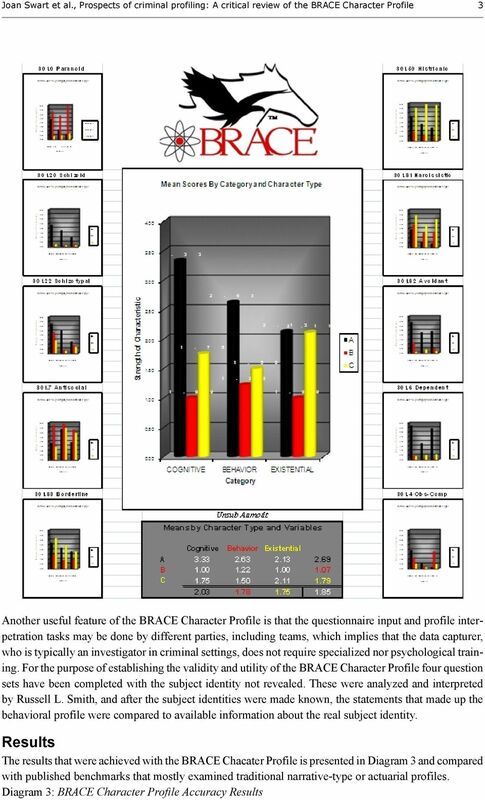 A validity test of the BRACE Character Profile. The Master's Advocate, 15(2), About the Authors Joan Swart achieved a Master of Science in Forensic Psychology with a GPA of 4.0 in 2011 at the Walden University in Minneapolis, MN, and is currently a Psy.D. candidate at the Eisner Institute for Professional Studies in Los Angeles, CA. Joan is a member of the Psychological Society of South Africa, American Psychological Association, International Association for Correctional and Forensic Psychology, International Academy for Investigative Psychology, and the Psi Chi International Honor Society in Psychology. For more information or comments please contact Russell L. Smith, M.S. is a Certified Health Services Provider-Psychological Associate (HSP-PA) with over 30 years of experience developing and implementing individual, group, and system wide programs in mental health institutions and community-based settings. 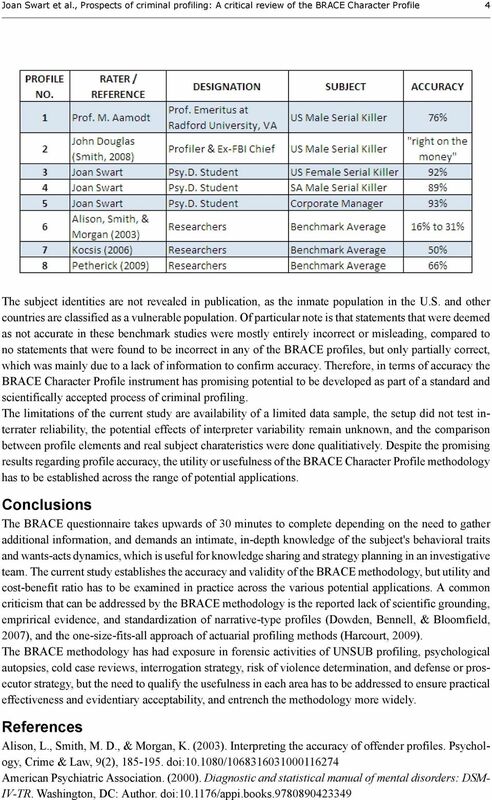 Russell developed the BRACE Character Profile instrument, of which various applications have been presented at local, state, and national levels in the U.S. APA reference: Swart, J., & Smith, R. L. (2011, September). 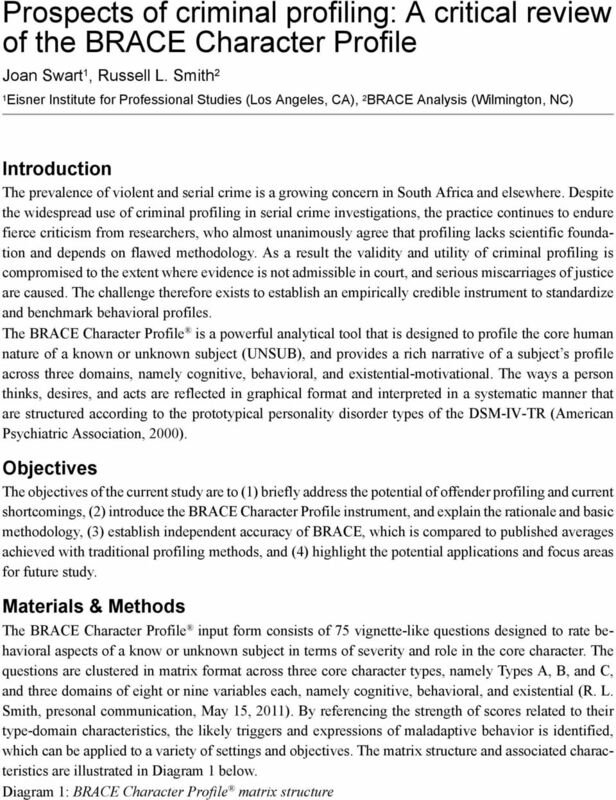 Prospects of criminal profiling: A critical review of the BRACE Character Profile. Presented at the 17th South African Psychology Congress, Johannesburg, South Africa. TEXT: Turvey, B. E. (2008). Criminal Profiling: An introduction to behavioral evidence analysis 3 rd Edition. New York: Elsevier, Inc.
CURRICULUM VITAE Michael T. Wiltsey Education Drexel University Ph.D. in Clinical Psychology, March 2008 Philadelphia, PA Specialization in Forensic Psychology John Jay College of Criminal Justice M.A. Master of Science in Forensic PSYCHOLOGY Psychology at AIC Graduate study in psychology is based on a commitment to intellectual freedom and personal integrity and the important role they play to everyone. Supplementary Readings: Criminal Profiling: International Theory, Research, and Practice. Richard N. Kocisis, editor. Humana Press, 2007. ONE FLEW OVER THE CRIMINAL JUSTICE NEST ONE FLEW OVER THE CRIMINAL JUSTICE NEST CRIMINAL ACT THE UNABOMBER AND ME. Welcoming Address. by State Minister. Dr. Winfried Bausback. at the International Conference on. Psychology and Law. on August 4, 2015. Curriculum Vitae License #36024 The Physician s Centre 3131 University Drive East Bryan, TX 77802 (979) 450-5320 drjenniferrockett@tsecuremail.com www.drrockett.org Education Ph.D. (2009) M.A. (2005) B.A. Lesson One INTRODUCTION TO CRIMINAL PSYCHOLOGY Aim To define crime and criminal psychology. Before we go on to consider the work of the criminal psychologist, let us first consider, what exactly is crime?